2.2 kinds of decompression methods: 360-degree rolling ball + pressing ball, two different ways of pastime, combined with sound feedback, decompression vent effect is significant. both parties will send an alarm to avoid losing valuables, children, pets or other people. 7. PCBA + battery design: The rear cover opens to replace the battery, replace it once every 3-6 months. 1. Download the APP, search for "isearching", APP in the mobile app store and download it. 2. Turn on Bluetooth and locate the mobile phone and anti-loser automatically connected. 3. Open isearching APP According to the prompt connection, alarm, mobile phone and anti-loser bi-directional sound prompt, determine the bit to find. Switch on:Press and hold the button on iTag for 3 seconds until the log "Beep" sound. 【Anti-lost and Stress Toys】The 2018 New designed with two function-Anti-lost and decompression give you the different experience! 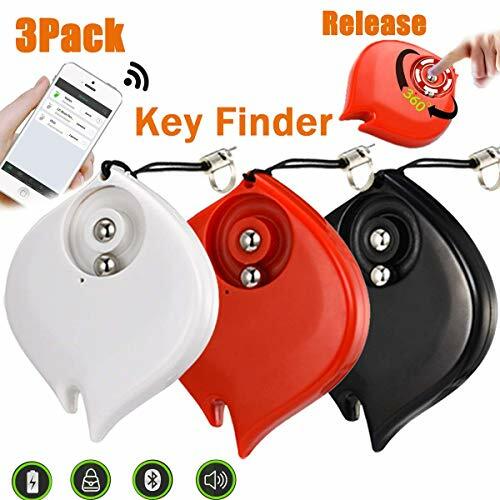 the key finder has a sound alert function once device away from a safe distance(32-50ft).connect with your phone and the device, your phone and the key finder will make alarm alert if it's not by your side.Stress Ball is a great metal ball for stressed out children and adults. Everyone's got some tense days, and this will help you relieve the stress and kill time. 【Two-Way Alarm:】Support wireless remote take photo,when your phone or key finder in safe sensing range, press the finder button and your phone will make sound alert 80DB,Open App and tap the "ring" , key finder will beep.The effective range is 32-50ft indoor and 160ft outdoor. if lost or disconnected tracker, APP records the location where you had it last in the map.our tracker perfect work for your wallet handbag even dogs cats luggage,no need to wast time find any small thing. 【3 Steps Set】1. Download the APP, search for "isearching", APP in the mobile app store and download it.2. Turn on Bluetooth and locate the mobile phone and anti-loser automatically connected.3. Open isearching APP According to the prompt connection, alarm, mobile phone and anti-loser bi-directional sound prompt, determine the bit to find. 【Support IOS Android 】compatible with Android, ios and other intelligent systems. Freely interconnect with your mobile, ipad, laptop, psp and other digital devices. The button on the device also used as a camera remote, make it more convenient for you take photos, Can't find your phone? Simply press the button on your key finder to make your phone ring. If you have any questions about this product by BSWEEII, contact us by completing and submitting the form below. If you are looking for a specif part number, please include it with your message.